The next NUX Leeds event is taking place on Monday 25th March at Platform, New Station St, Leeds LS1 4JB. John describes his talk: “Wherever I go, I see teams with good agile practices for making digital products. And teams doing good basic user research – regular usability testing and some interviews and visits. This is helping those teams make services that work better for the people who use them. 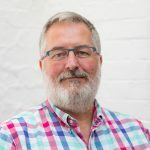 In this talk John will describe how teams can create a stronger chain from what they learn, through their design ideas, to explain and justify what they make. John is currently Head of User Research at dxw, where he’s helping public sector teams to make good technology decisions and build better services for citizens, businesses and colleagues.